The Zoho Mail Admin app: the email control panel at your fingertips. The Zoho Mail Admin App is designed with a complete understanding of System Administrators like you. 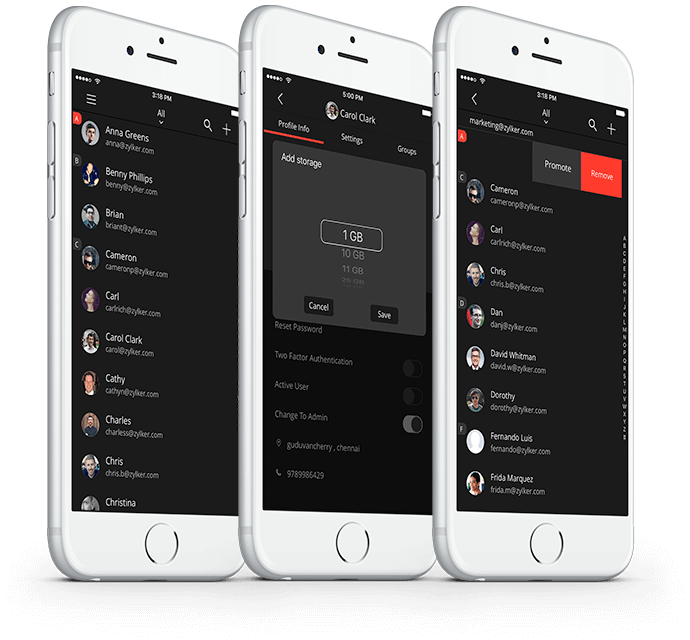 The app, with a classic black and red design reminiscent of the powerful system shell, lets you manage all your admin tasks in just a few swipes. Add users and change user roles all on the go. Click on a user's profile to reset their password, to turn on TFA (Two Factor Authentication) and to change their role from a User to an Admin, or vice versa. Under the Settings tab, enable POP, IMAP, Active Sync or Spam check for each individual user. There are some users in your organization who need more storage than the others. Now you can add extra storage for a user using the "storage" add-on inside the app. Add members to a group, remove members from a group and change their roles. Swipe left on a contact in a group to Promote them or Demote them. Promote changes their role to a moderator, and demote, back to a member. There are some emails that require moderation from you as an administrator. There are a few emails that are too urgent to wait for you to get to your computer. Now, you can approve/reject emails that need moderation from within the app. Click on the Mail Moderation tab, choose the group, open the email that needs your approval, and click accept or reject. See how the app works, and explore other features through this short 40 second video.